Here you will find out about my off-grid power supply - solar, hydro, batteries, inverter, wiring, and loads. There is no mains electricity at the site. All electricity is generated by four 75 Watt BP solar panels, and I have just installed a micro hydro turbine, the Water Baby from Energy Systems and Design, Canada. This hybrid system should provide me with all my needs summer and winter. When I first moved to the site, I got my power from the shed of a very kind neighbour. I had two 65 AH leisure batteries, one connected up to my loads, the other charging in the shed, and swapped them around once a week. 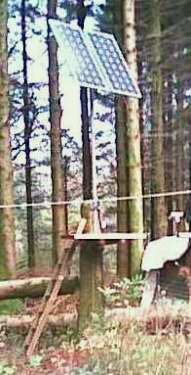 I did this for a few years. During that time I also tried out gas for lighting, but the consumption was very high, the light very unpleasant and accompanied by a constant hiss, not to mention the health implications. Early on I bought a Rutland wind generator and rigged it up in the windiest spot, but that was still too sheltered. Eventually I bought two BP 75 Watt solar PV panels, a charge controller and a new set of 185 AH deep cital batteries. The panels gave me plenty of electricity in the summer, but during the winter, on this shady site, they only produced a negligible amount of power, in the milliamp range on a grey day. For a brief time I supplemented the solar power with a hand-crank generator, which I converted to pedal crank. It was an old army field telephone generator, and already had the right Voltage and revs for human power. Although it would generate enough for low power lighting without exertion, it was certainly not enough to run a laptop computer, however efficient the design. Another two panels followed the next two winters, but multiples of near nothing, is still near nothing. As I wanted to spend fine days in the summer working outdoors, I did not want to be tied to doing any computer work when the power was available at that time. 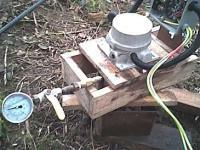 The best solution was a hybrid system with a micro hydro generator, rain is plentiful in the winter in Wales. A survey done on the river concluded that it would be possible to get enough for my needs with a relatively inexpensive generator which would be submerged in the river (the Ampair generator), however, the river can flood very quickly, and there are often trees and branches washed along which would smash the generator to pieces, and there is the small point of the river being an SSSI, and the nature council would not favour an installation, even one with fish protection. I could have built a small one to run from the springs at the top of the hill, but with a million and one projects, I just couldn't spare the time. Then I heard about the Canadian micro generator, the Water Baby, the smaller sister of the Stream Engine, and a new design. The data looked promising, and so I sent away for it. I installed it over the last couple of months, and after a few teething problems, I was getting enough power during the wettest spells of weather to run the computer up to 18 hours a day (yes, during the first stages of producing this website, I sure did burn the midnight hydro power). Presently, after a few weeks of dry and grey weather, my batteries are very low again, as the springs go down quickly, when not replenished, but the weather forecast is good, plenty of rain. An inch or two of rain will give me enough power for several weeks. The payback period is the length of the life of the system. What I mean by that is that you are being payed back every day with the benefit of light, music, the use of your computer, and whatever else you use electricity for. Oh, you meant cost? What is the payback period on your car, a bottle of wine, your TV, chocolate, a vacation......? If you can raise the money to pay for it without going short on necessities, you can afford it.